This is a wonderful all-in-one kind of meal. The nutrition is great, the method (skillet) is fabulous because you only dirty one pan, and the taste is awesome! The simple list of ingredients made me wonder if the flavor wouldn’t be all that awesome, but I was wrong. 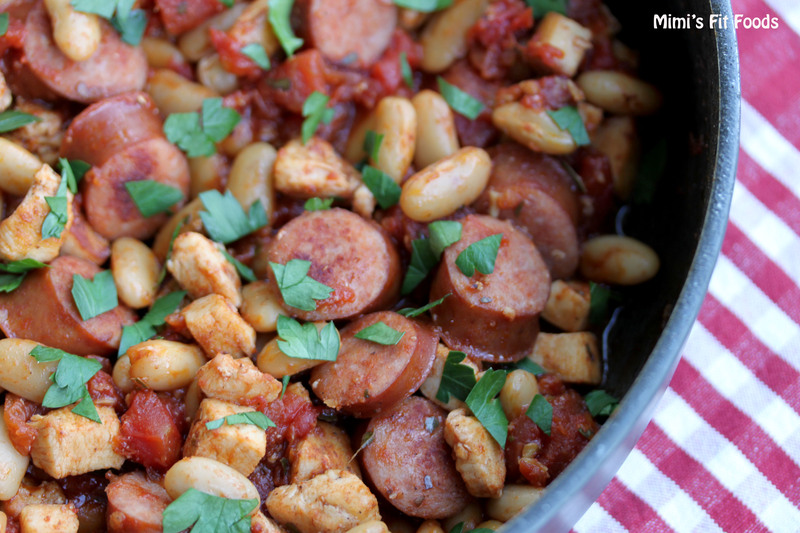 This dish is full of flavor and the combination of sausage, chicken, tomatoes, garlic, and a hint of red pepper is delightful. I also loved having the cannellini beans as my carb for the night. They pair well with the flavors and it gave me some variety to what I usually have for my carb. You can add as much red pepper as you like which allows you to control the level of heat you want for the dish. I wanted a hint of heat . . . just enough to add a depth of flavor, so I added approximately 1/4 teaspoon. Clearly you can add more if you want more heat (the original recipe had much more heat than this), or less if you want less (all of you with children). Heat a large high-sided sauté pan over medium-high heat. Add the olive oil to heat. Once hot, add the sausage and chicken and cook until heated through and no longer pink (sausages will brown), about 8 minutes. Remove sausage and chicken from the pan to a plate and reserve. Add the garlic, and sauté until fragrant, about 30 seconds. With a wooden spoon, stir in the diced tomatoes, red pepper flakes (I used 1/4 teaspoon), bay leaves, salt and pepper. Lower the flame, cover the pan with a lid, and simmer for 10 minutes, until the tomatoes have broken down and thickened to a sauce-like consistency. 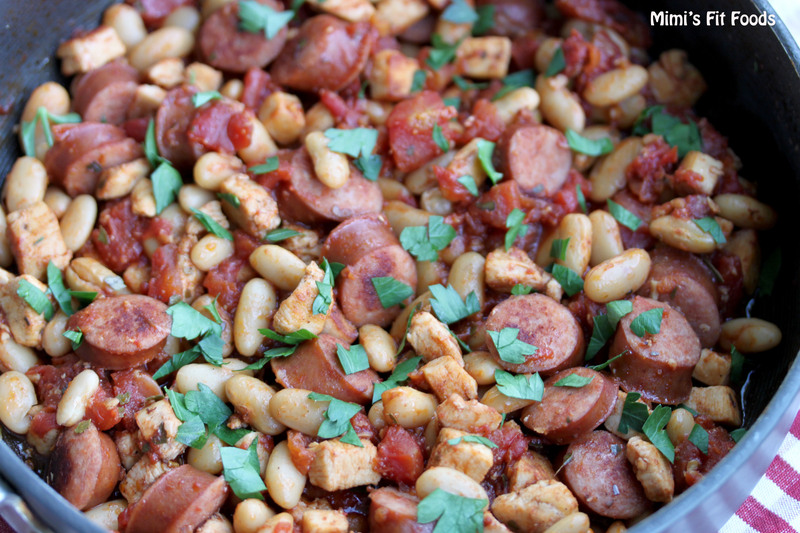 Add the sausage and chicken (and any juice left on the plate) and beans to the thickened tomatoes. Stir well and simmer for another 10 minutes. Add the chopped parsley before serving.